What is common between your first love and A – Z, the alphabet? You never forget either of them, not even a part, regardless of all the experiences, knowledge, information, work, life, good, bad, rubbish, garbage etc. that is shoved into your memory over time. A Quest for Spring reminds you of that. First love. The theme of the story is unquestionably – spring. 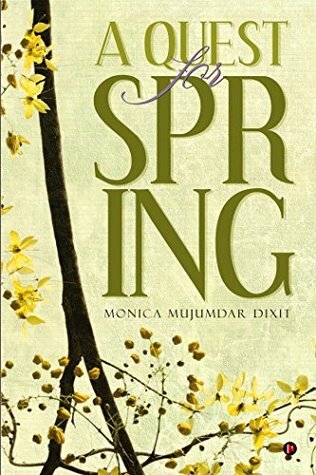 Spring is the underlying current in the entire story in all it’s forms, love between the characters which turns into autumn and again turns into spring; happiness of the characters – who also traverse from spring to summer to autumn to winter to spring again. The plot is divided into four parts. The reader particularly loves the first part where the bond between the protagonists develops and gets snapped with a twist in the tale. The other parts are about the characters travelling further in their journey and describe how life makes a journalist out of one of the protagonists and a Chief Minister out of the other. The crests and troughs of their stories comprise of all the trade-offs and compromises they make in order to propel their lives forward. The protagonists Raehan and Amolika are etched in detail and their thoughts, action, behavior etc. have been portrayed with intricate detail. Raehan’s withdrawal and introversion, given his Kashmiri background beautifully turns into comfort and approachability when he forms a bond with Amolika, friendship that blossoms into love. Amolika is the central character and the reader will be able to relate with her in entirety. Her passion and dreams for a career, her state of confusion about Raehan followed by denial, followed by jealousy for the ‘other girl’, followed by acceptance of her own love and the choices that is she is forced to make later in life, have all been etched out in a rather relatable fashion. All the other characters including the protagonist’s guardians, friends, even spouses have a fair share of space in the narrative and have been written out picturesquely. The author has drawn a vivid picture with every chapter and every incident. For instance, Raehan’s mental monologue about his childhood memories, of being so accustomed to gunfire, that he stops feeling scared of the same, rather the otherwise horrifying sounds start to take the place of lullabies for him and of children rather than playing scrabble, making games of identifying the gun from the sound of gunfire deserve special mention. Particularly the first part is very endearing as it is cleverly interspersed (being set in the late 90’s of the twentieth century) with “Everything I do by Bryan Adams”, “An Affair to Remember”, “500 miles away from home”, Maruti 800’s, the old cousin of our i pod – the walkman, Shahrukh Khan’s 90’s movies and even some untoward events in world history like the deaths of Lady Diana and Mother Teresa. Once or twice the narrative does seem a little more stretched than necessary but the story progresses smoothly with all its twists and turns and the characters make some important choices towards the pointy end of the tale. The reader closes the book with misty eyes and a happy heart. Sign into Goodreads to see if any of your friends have read A Quest for Spring.